Barcelona is known for parks, nightlife, museums, historic sites, and fun & games. Your plan includes some of its best attractions: admire the landmark architecture of Basilica of the Sagrada Familia, pause for some photo ops at Casa Mila "La Pedrera", contemplate the long history of Casa Batllo, and tour the pleasant surroundings at Park Guell. To find ratings, other places to visit, traveler tips, and other tourist information, read our Barcelona trip planning site . Philadelphia, USA to Barcelona is an approximately 12-hour flight. You can also do a combination of train and flight; or do a combination of bus and flight. The time zone changes from Eastern Standard Time to Central European Time, which is usually a 6 hour difference. July in Barcelona sees daily highs of 84°F and lows of 71°F at night. 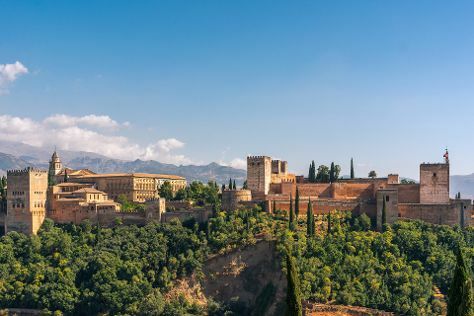 Wrap up your sightseeing by early afternoon on the 4th (Wed) to allow enough time to travel to Granada. On the 5th (Thu), wander the streets of Albayzin, admire the natural beauty at Generalife, and then step into the grandiose world of Alhambra. To see other places to visit, reviews, photos, and tourist information, refer to the Granada sightseeing planning tool . Traveling by flight from Barcelona to Granada takes 4 hours. Alternatively, you can do a combination of flight, taxi, and train; or drive. Expect somewhat warmer weather when traveling from Barcelona in July: highs in Granada hover around 95°F, while lows dip to 67°F. Finish up your sightseeing early on the 6th (Fri) so you can go by car to Ronda. Ronda is known for historic sites, nature, museums, nightlife, and outdoors. Your plan includes some of its best attractions: explore the stunning scenery at El Tajo de Ronda, hit the best photo ops around with an inspiring photography tour, relax in the rural setting at Reservatauro Ronda, and wander the streets of Old City. To see more things to do, photos, reviews, and other tourist information, read Ronda driving holiday planner . Traveling by car from Granada to Ronda takes 2.5 hours. Alternatively, you can take a train; or take a bus. Expect a daytime high around 95°F in July, and nighttime lows around 66°F. Finish your sightseeing early on the 8th (Sun) to allow enough time to drive to Seville. Start off your visit on the 9th (Mon): admire the natural beauty at Royal Alcázar of Seville, then enjoy breathtaking views from Torre Giralda, then take in nature's colorful creations at Parque de Maria Luisa, and finally admire the landmark architecture of Plaza de Espana. On the 10th (Tue), you'll have a packed day of sightseeing: get to know the fascinating history of Barrio Santa Cruz and then take some stellar pictures from Seville Cathedral. To see ratings, photos, traveler tips, and more tourist information, refer to the Seville day trip site . Traveling by car from Ronda to Seville takes 2 hours. Alternatively, you can take a bus. In July in Seville, expect temperatures between 91°F during the day and 68°F at night. Finish your sightseeing early on the 10th (Tue) to allow enough time to take a train to Madrid. Madrid is known for museums, nature, shopping, nightlife, and historic sites. Your plan includes some of its best attractions: examine the collection at Prado National Museum, admire the striking features of Plaza Mayor, admire all the interesting features of Stadio Santiago Bernabeu, and explore the galleries of Royal Palace of Madrid. For ratings, reviews, more things to do, and tourist information, you can read our Madrid road trip planning app . Traveling by train from Seville to Madrid takes 2.5 hours. Alternatively, you can fly; or drive. July in Madrid sees daily highs of 94°F and lows of 68°F at night. Finish your sightseeing early on the 13th (Fri) to allow enough time to travel back home.